ABLE offer ‘Optica’ Chilled Mirror Optical Dew Point Hygrometers, with precision dew point measurement controlled by chilled mirror sensing technology – providing NIST traceable humidity, temperature and pressure measurement anywhere via the worldwide intranet. 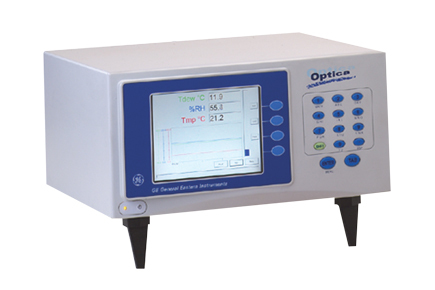 The Optica Chilled Mirror Hygrometer measures dew point temperature by regulating the temperature of a polished metal mirror by the use of optical feedback such that a constant mass of dew or frost is maintained. The temperature of the mirror is measured with a precise PRTD and is by definition equal to the dew or frost point.